Are you curious about how to improve your speaking mindset? Most of us don’t realize how powerful our words are and even how we are speak them into existence. We can use our words to help us with our speaking or we can allow what we say to affect us negatively. When we say words like the list above, we are ultimately creating what we don’t want with public speaking instead of what we do want. How do you do change the disempowering thoughts and make them work for us, rather than against us? Use the power of affirmations to shift the negative thoughts and turn them into positive outcomes. Affirmations are usually positive statements that we repeat numerous times so that we can eliminate the negative thoughts and create the positive experiences we desire. Begin by speaking what you want in your life and stay away from what you don’t want. To help you, I am going to share some of my favorite public speaking affirmations. I created these affirmations for my live event attendees, such as Empowered $peaker Event, and my private VIP coaching clients. Practice these affirmations, say them with conviction, believe the words you are speaking and see the difference that you will feel about yourself. 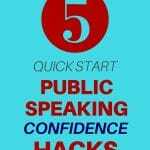 All of them will help you to improve your speaking results. #1 I deserve to be successful speaker because I make a difference in the lives of others, every day. #2 I admire and model rich successful, powerful and authentic speakers. #3 I am a master speaker for the purpose of helping others live extraordinary lives. #4 My life is prosperous, abundant and rich beyond my wildest dreams because I teach what I love. #5 Every time I speak in front of a group or audience. 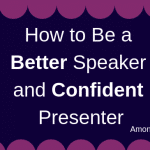 I become a more confident, compelling and powerful speaker. #6 I use my unique talents and gifts to contribute to others. #7 I am truly grateful, and new speaking opportunities and unexpected income comes to me nowt. #8 I’m willing to face my fears, learn lessons and take action now. Feel free to add your own positive affirmations to the words you say and modify my versions for your needs as you desire. Commit to saying the Public Speaking Affirmations every day, over and over until you truly believe all that you are saying. And remember the minute a negative thought comes into your head, you have to say “Thank you for sharing!” Then speak your affirmations which will make our negative thoughts powerless. 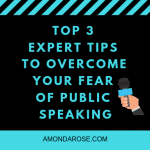 This awesome article is part of a essential series for public speakers was created for you because you are committed to learning to be the best public speaker you can be. The information in this blog article series is just the beginning of being a highly effective trained speaker. Click on the links below, because I have put together these additional step by step speaker tools and presentation tips to help you succeed. 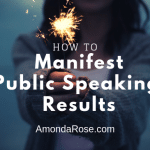 I am passionate about helping you become the best public speaker you can be so keep reading!